SHOWCASE '93 #8 (1993) DC COMICS BATMAN! KNIGHTFALL Pt 14!! GLENN FABRY COVER! Showcase’93#8 Incredible Condition 9.4(1993) Deadshot,Janson Art!! 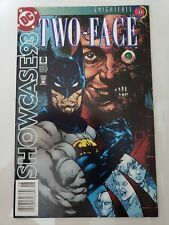 SHOWCASE 93 Two-Face #8 (1993 DC Comics) High Grade copy. SHOWCASE 93 TWO-FACE LOT OF 2 - #7 #8 BATMAN KNIGHTFALL -SUPER BUY!!! This page was last updated: 21-Apr 20:32. Number of bids and bid amounts may be slightly out of date. See each listing for international shipping options and costs.